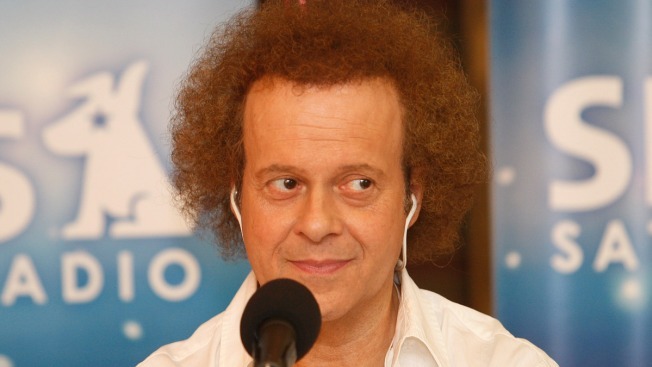 In this July 13, 2008 file photo, fitness expert Richard Simmons hosts his weekly radio show on Sirius Satelitte Radio in Beverly Hills, California. Simmons made his first public comment since 2016 in a Facebook statement on Wednesday. After an absence from the spotlight, Richard Simmons is speaking out directly to his fans, saying, "Hope to see you again soon!" Simmons posted a statement on his Facebook page Wednesday, and his spokesman, Tom Estey, confirmed its authenticity. The statement marks Simmons' first public comments since calling into TV's "Entertainment Tonight" last year. The 68-year-old fitness guru has been out of the public eye since 2014, an absence that inspired the popular podcast "Missing Richard Simmons" earlier this year. After reportedly being hospitalized Monday for severe indigestion, Simmons sent greetings Wednesday to "everyone who has shown concern for me and sent their good wishes." He also says that "by now you know that I'm not 'missing,' just a little under the weather. I'm sure I will be feeling good and back home in a couple of days."